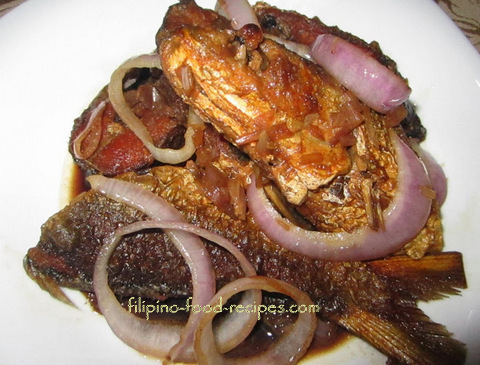 Bistek na Bangus is fried Milkfish or Bangus with a tart and salty sauce made from calamansi juice and soy sauce. Bistek, a colloquial term for beefsteak, is a Filipino dish of thinly sliced beef marinated in lime and soy sauce and sauteed with rings of onions. A variation of the bistek, this bangus dish is for some of us who would rather have fish than red meat (not necessarily healthier since the fish is fried). The challenge with the bangus is in the frying because bangus is notorious for oil splatter during frying. I wipe the fish with paper towel to totally dry the skin, and lightly dredge in all-purpose flour, removing any excess flour. This will help a bit with the oil splatter. My kids love this dish, but I try to be careful as to give them the belly part because the bangus has a lot of fish bones. 1 Pat dry the bangus with paper towel and sprinkle some salt and pepper..
2 Dredge in flour and shake off excess flour. Fry until golden brown and set aside. 3 On a separate pan with a little oil, saute the garlic and onion. 4 Add the soy sauce and calamansi juice with 2 cups of water, bring to a boil. 5 Put the bangus and boil until the sauce reduces to half, transfer on a platter. 6 Then, using the same pan, fry the onion rings in 2 tablespoon oil, then add 1 tablespoon of sauce from the fish. 7 Garnish the onion rings on top of the bistek na bangus.